Writing an informative speech involves giving information without expressing a point of view. You are not trying to persuade or motivate your audience, you are merely informing them. That may sound a little dry and boring - but crafting an informative speech is still a creative process! When you put your audience at the forefront of your thinking, you can put your creativity to work in a number of areas. With an informative speech, always keep in your mind that the audience needs to clearly understand and retain the information you convey. Organizing an informative speech is a relatively simple process, but do spend some time considering how best to present the material you have to your audience. When presenting historical or biographical information, chronological organization - that is, presenting the points in the order of their occurrence in time - seems the most logical. Using a logical approach increases audience understanding and retention. However, to grab your audience's attention early in the speech it might be more effective to relate the most interesting and perhaps climactic occurrence of your chronology first and then follow it with a chronological sequence of what led up to it. When writing an informative speech about a topic that doesn't fall into a chronological organization, you could use a topical or spatial organization. With topical organization, your main points are divided into categories or varieties. For example in a speech about dogs you might talk about 3 different breeds and their characteristics. With spatial organization, you arrange your main points in an order according to their location. An example of this is speaking about different cities in Spain. You might start in the south and move toward the north in your organization. The important element is to make sure that the information is easy for your audience to follow and retain. Help your audience remember what you said! You can enhance the retention of your audience with a few different creative techniques. Besides using a logical organization, presenting the information in more than one way is a good method. Using visual aids is a common way to make sure that you reach both the auditory and visual learners in your audience. A PowerPoint presentation or a series of overhead slides with headings that reinforce your words is an effective visual aid. If you do not have access to that technology you could simply use a flipchart or a poster prepared in advance. When using visual aids, make sure that they are neat and organized. Use color when possible and display them while in use so that the whole audience can see them. Visual aids are a natural place to apply your creativity so feel free to make them interesting. Don't, however, make them so complex that they are distracting! Make sure when writing an informative speech that you repeat the important information a few different times, in different ways. This way, it will be clearly understood and its importance will be emphasized. Feel free to ask your audience if they understand or ask them to answer questions about the information you have already given. 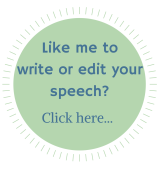 This keeps them engaged in your presentation and helps you know that your informative speech has been effective.